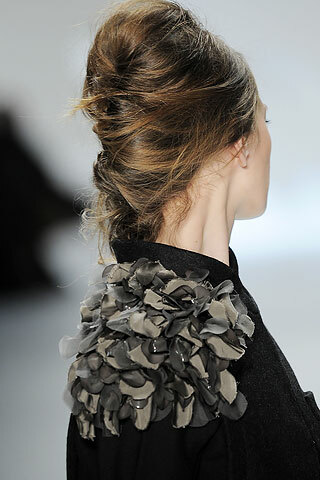 I love Vera Wang for her creative details, her beautiful evening wear and her neckpieces. The first pictures of her new collection approved my expectations but there were some bad suprises. …and these combinations of workout clothes with a high fashion organza jacket or a volumnius pearl necklace have also gone wrong. A well tailored but still minimalist cutted pair of trousers might have saved the right oufit. But leggins in combination with a loose cardigan and a loose shirt was simply too much. The left outfit is not as bad as the right one but still the jersey fabric of the jumpsuit is distracting. 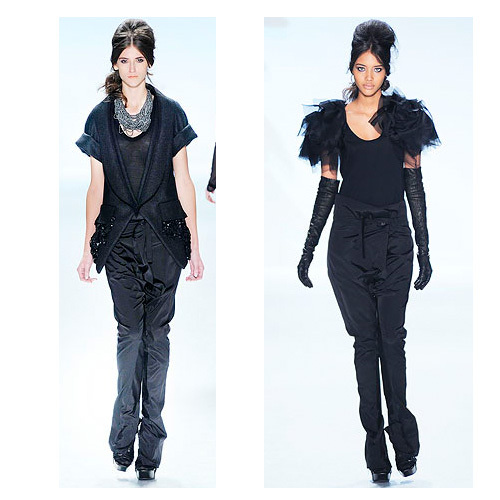 This entry was posted in Fashion, Labels and tagged New York fashion week fall 2010, Vera Wang fall 2010. Bookmark the permalink.